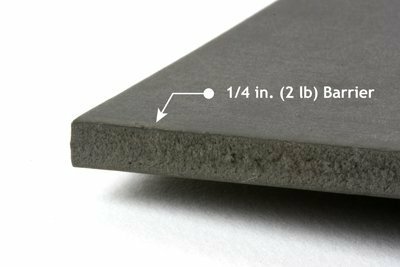 One of our most popular and most powerful soundproofing solutions, the Quiet Barrier™ HD Soundproofing Material sheet is a 1/4-inch thick, 2 lb/sq ft 4×8 sheet of high-density, non-porous material that is superior at blocking sound. Each sheet covers 32 square feet of surface area, so it is simple to cover areas large and small. Its high-density sound blocking power makes this sound absorbing material sheet suitable for recording studios, home theaters, restaurants and more. The soundproofing material deadens harsh noises and blocks sound transfer. You can enjoy clear sound and communication within the soundproofed area — the sounds inside won’t escape, and you won’t be bothered by extraneous sounds from outside. 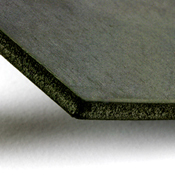 Each Quiet Barrier™ sheet has multiple layers of soundproofing protection. It blocks noise like traffic from the street, loud music from neighboring buildings or units and other day-to-day sounds, while also insulating you from vibration and impact noise. 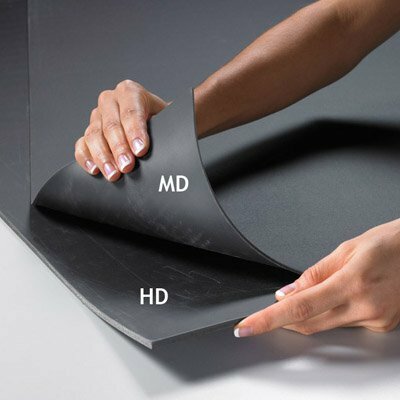 If you need soundproofing for your location, such as at a restaurant or suite of offices, you won’t find a better value than Quiet Barrier™ HD Soundproofing Material sheets. They are superior to most standard forms of soundproofing, are quite affordable and are easy to install with complete coverage over the desired area — especially if you order your soundproofing material with our simple “peel and stick” pressure sensitive adhesive (PSA). 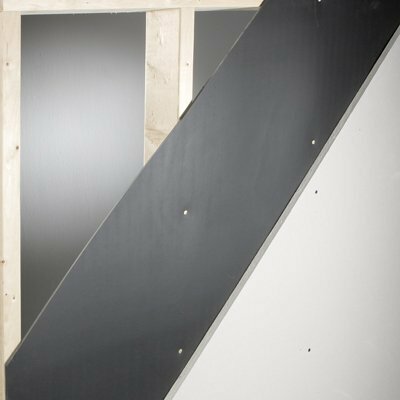 Before starting your next soundproofing project, make sure to order plenty of Quiet Barrier™ HD Soundproofing Material sheets today. DEEP DISCOUNT. ON SALE NOW! * This product is not eligible for promotional offers. Dimensions 4 ft. x 8 ft.
Quiet Barrier™ HD (w/PSA) soundproofing material (1/4 in. 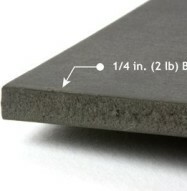 2 lb./sqft.) 20 ft. roll is a high density, non porous material that exhibits a non-resonant quality due to its flexible nature, and is one of our most popular soundproofing products. The Quiet Barrier™ family products control noise by blocking the transmission of sound energy and damping vibrations caused by sound energy. Special Order Sizes and Thicknesses are available. Dual soundproofing function — The mass of Quiet Barrier™ blocks sound while its flexible nature dampens sound energy, giving improved acoustic performance over competitive rigid products. Value — Pound for pound, Quiet Barrier™ products have better noise reduction characteristics than steel and other building materials. Low Profile — Valuable square footage is maximized. Quiet Barrier™ MD is only 1/8 in. thick and Quiet Barrier™ HD is 1/4 in. thick saving space and money. Variety — Quiet Barrier™ soundproofing products are available in a variety of lengths and widths. Also, some Quiet Barrier™ products are available with a “peel and stick” pressure sensitive adhesive (PSA). Custom shapes and sizes available upon request. In-stock — We stock all advertised sizes and configurations of Quiet Barrier™ in large quantities. Most products are shipped the same day they are ordered and arrive at your project in three business days. Proven History — Over 1.5 Million square feet of Quiet Barrier™ soundproofing products have been installed in projects nationwide. Which Quiet Barrier™ soundproofing product is right for me? Quiet Barrier™ can be added to a variety of common wall / ceiling constructions to improve the sound blocking performance of the structure. Choose the right Quiet Barrier™ product based on the type of noise you are trying to prevent from entering or leaving the space. 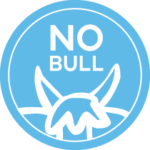 Quiet Barrier™ products perform well when trying to deter common noises with average decibel levels. These noises can be generated from voices, TV’s and stereos. If noise levels are higher than usual, typically from loud stereo systems, home theater or recording studio environments, then other products used in conjunction with Quiet Barrier™ may be necessary. If you are trying to prevent common conversations or voices from entering or leaving a space, then choose Quiet Barrier™ MD. If you are trying to prevent TV and stereo noise from entering or leaving a space, then choose Quiet Barrier™HD. Quiet Barrier™ products block the transmission of noise from one area to the next. The “noise source” hits the barrier and is reflected back into the room or space of origin. See figure 1. Typically, the noise is not muffled or absorbed in any way, which means that decibel level within the source room remains the same or is increased. 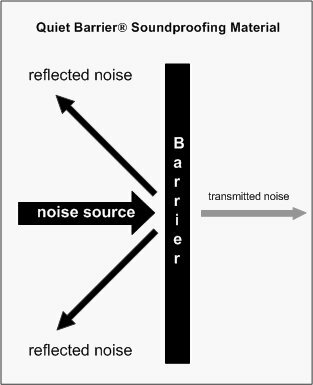 The difference between the source noise and the transmitted noise is the sound transmission loss. I love the Quiet Barrier! My husband and brother in law installed all of it in a weekend and after the first wall was done I was able to hear a huge improvement. We used it for the rooms we keep our dogs in and I’m not hearing their crazy barking in the middle of the night. I ended up coming back and ordering more for a couple different rooms because I was so happy with the first room. I’ve told everyone who I can about the Barrier. Thanks. Quiet Barrier was awesome, I put it up with a friend over a weekend and immediately saw improvement. I decided to go with the thicker of the two options because what I was told from the company was it works better with lower frequency. Judging by the fact that my neighbors don’t yell at me when I play my drums anymore, I would say that they were right. My dad has been living with us for the past 3 mo. and he listens to his tv LOUD. It had become intolerable so we decided we had to do something. Eventually I found Soundproof Cow on the internet and called in. They told me about what all options we had, and we decided the best option for us was the Quiet Barrier Soundproofing mat product. We were able to mount it to the ceiling without having to tear the drywall down. The guy we talked to was right, it wasn’t the prettiest thing to look at so we had to add an additional layer of drywall. From that point on we didn’t hear dad blaring old reruns of “Welcome Back Kotter”. I’ll definitely come back for more stuff if I ever need it. I was fairly happy with the Barrier, still able to hear some things through the wall I put it on, but it’s significantly more muffled.